Unusual and irregularly ovoid shaped chalky-white colored Fairy Stone concretion from Morroco, Africa. Fairy Stone Concretions are also referred to as goddess stones or Menilite Opal. 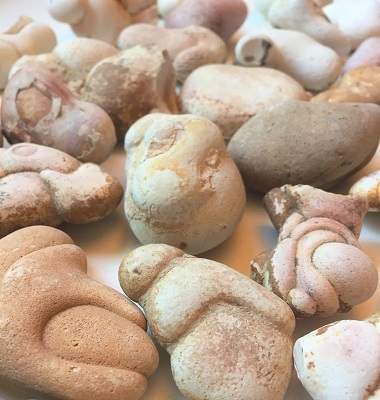 Fairy Stone concretions are considered as a type of natural good luck charm resonating with the vibrations of prosperity and enhancing feelings of LOVE and well-being. 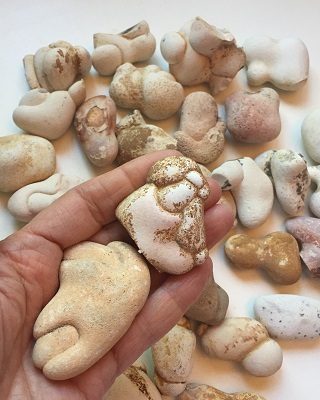 Reminiscent of ancient goddess sculptures of "Venus figurines," Fairy Stone concretion offers a “motherly” energetic support for self-nurturing, caring about others, and caring for the Earth. Fairy Stone concretion energetically provides grounding, acceptance, flexibility, generosity and increases tolerance for self and others. Fairy Stone concretion also supports patience and endurance over the long haul. Fairy Stone concretion energetically supports balance in life when dealing with unexpected upheavals or as a result of the long term accumulation of circumstances. Fairy Stone concretion’s vibration aids in identifying and clearing unwanted emotional issues and outworn behavioral patterns. Fairy Stone concretion teaches you to take responsibility for your emotional being and encourages positive sustainable changes. Fairy Stone concretion energetically resonates with “down to earth” practicality and the appropriate usage of available resources. Offering comfort and nurturing energies, Fairy Stone concretion remind us to be gentle, take care of ourselves, and not to overextend our energies with commitments and resources. 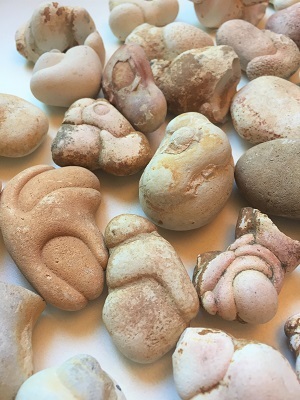 In healing, the energetic vibrations from Fairy Stone Concretions may have a soothing effect on the sympathetic nervous system and may be helpful to reduce feelings of stress, anxiety, nervousness, while alleviating and providing relief from pain. Fairy Stone Concretion is a wonderful crystal tool for stimulating and focusing the body’s own unlimited healing powers. Fairy Stone Concretion may be helpful in cellular regeneration. Fairy Stone Concretion may also be helpful with balancing hormonal levels, assist with fertility issues and in the dispersal of fibroids and various types of cysts.